George Colman, an engineers assistant, marries Emma Bullock in May 1851 at Camberwell. His father is Alexander Colman, a Merchant, and her father is William Bullock, a Wine Merchant. 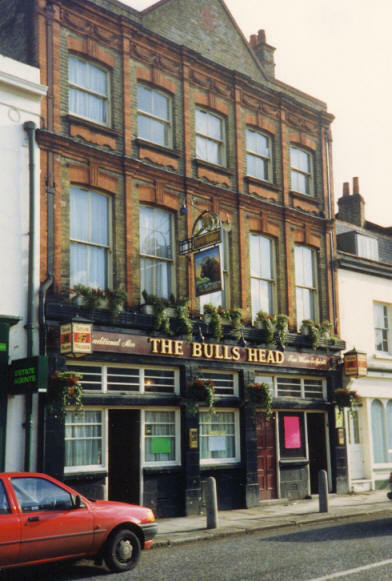 22 May 1867/The Will of George Colman late of the "Bulls Head" Inn in the Parish of Clapham in the County of Surrey Licensed Victualler deceased who died 1 May 1867 at the "Bulls Head" aforesaid was proved at the Principal Registry by the oath of Emma Colman of the "Bulls Head" aforesaid Widow the Relict the sole Executrix. Effects under £1,500.